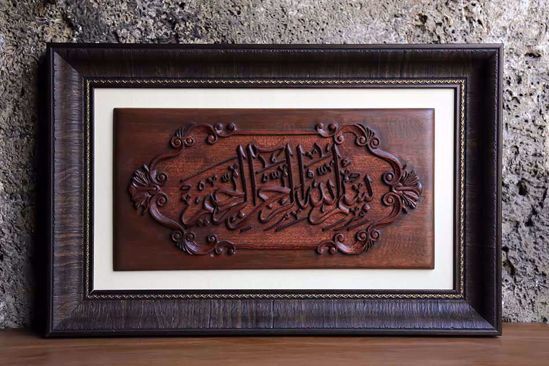 The artist carved the Arabic phrase "Bismillah-ir-Rahman-ir-Rahim" which means "In the name of Allah, The Most Gracious, The Most Merciful"
The holy Quran begins with the word Bismillahirrahmanirrahim. It is the phrase with which 113 out of 114 chapters of the Qur’ān commences. This phrase is very important for Muslims as they are encouraged to start all their actions with this phrase. Bismillah is like a key to an immense treasure of divine mercy, delights, and grace. They believe that beginning their actions in the name of Allah, The Most Gracious, The Most Merciful, is an indicator of spiritual enlightenment and success. Bismillah opens doors that would otherwise be shut. The artwork is carved from Sipo. There is no dye and stain involved.